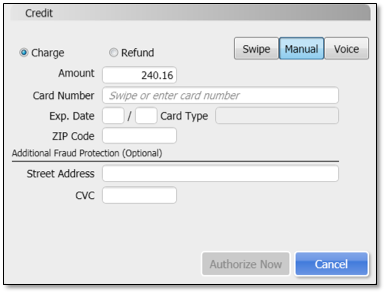 If you have an active Intuit Merchant Account, you may see different authorization options when processing credit/debit card transactions in QuickBooks Desktop Point of Sale. From the File menu, click Setup Interview. Select Yes to Would you like to accept credit and debit cards? section and click Sign In. Sign in with your Merchant credentials. On your Point of Sale, click Make a Sale. Enter the items and click Credit. PIN Pad: Used when an iPP350 PIN Pad is connected with your QuickBooks Desktop Point of Sale to process an EMV card. 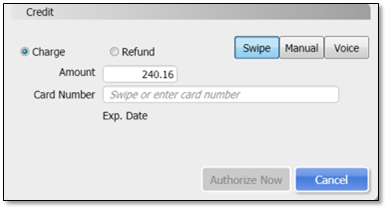 Swipe: Swiping the card may qualify your sale for the lowest rate, and is proof the card was present at the time of the sale. Manual: This is an alternate method if in any case you cannot swipe/insert the card. 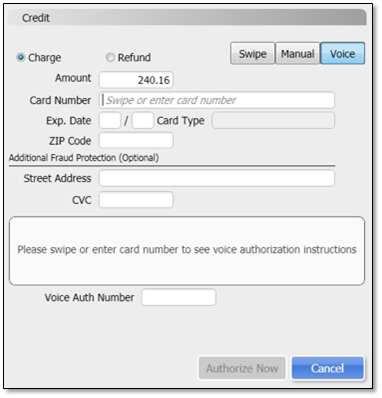 Voice: You can authorize the card via telephone when electronic confirmation is not possible (e.g. internet connection is not working). Be sure to capture all information on this screen so that you can record your transaction once you are back online. Insert/swipe/enter the card information then click Authorize. This may happen if the payment type you are using is not allowed in your company preferences. From the File menu, select Preferences and click Company. On the left pane, select Receipt Tendering under the Sales option. In the Card Types section, check to ensure the card type you're trying to process is selected. If you are not sure which cards you're allowed to accept, please contact Intuit Payment Solutions at 1-800-558-9558.